Regular readers know that I’m fascinated by innovation — and it is easy to forget — or overlook — the role of government in innovation. 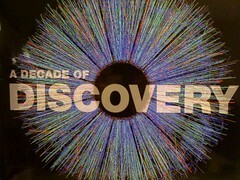 The Energy Department’s 17 national laboratories have been spurring innovation for a long time now, and the Energy Department has come put together a coffee table book that looks at a decade of discoveries and technological innovations coming out of the national laboratories. Hundreds of particle tracks streaming from a collision of gold ions traveling near the speed of light in the STAR detector at Brookhaven Lab’s Relativistic Heavy Ion Collider (RHIC). Evidence suggests that golf-gold collisions at RHIC are creating a new state of hot, dense matter — a ‘perfect’ liquid that is quite different and even more remarkable then the gas that had been predicted by theory. Makes perfect sense now, right? Hear our conversation with the book’s author on Federal News Radio 1500 AM’s Daily Debrief with Chris Dorobek and Amy Morris here. You can get your own copy of the book at www.energy.gov/discovery.